Baby Proof: When Are You Coming Back? – Reading My Tea Leaves – Slow, simple, sustainable living. Baby Proof: When Are You Coming Back? Thoughts on maternity leave from my sister Cait, while I’m busy perfecting my own nursing-whilst-typing technique. Almost as soon as my baby was born, colleagues and friends began to ask when I’d return from maternity leave. How long will you take? they asked. When will you come back? I’ve asked the same question of others, too, in all manner of settings and relationships. Living in a society where maternity leave—let alone paid maternity leave or paternity leave—is not a given, it’s a question that hovers around every pregnancy, every birth, every postpartum experience. It animates intimate conversations with close friends. It crops up in chats with professional colleagues negotiating workplace policies and politics. It takes up residence in idle dinner-party chatter. Without a comprehensive federal maternity leave plan or even a shared national culture around family leave, we probe one another for insights and experiences. We’re all looking for clues. In my case, I didn’t really take a maternity leave. I run my own small business, and while I delegated quite a few daily responsibilities, worked a ton from home, and turned down a few big projects in Oliver’s first year, I worked pretty much full-time on both sides of the threshold to motherhood. If there were an emblematic photograph of me in the first months, it’d probably be me nursing Oliver with one arm and typing with the other. The lines between my mothering life and my professional one converged and blurred the instant Oliver was born. And in the early weeks, I didn’t do much to keep them separate, conference calls be damned. Even so, there came a time, around the 10-week mark, when my husband and I got a bit more organized. I began to replace calls with in-person meetings. I went back to working from my office, a few more hours each week. Erin came by two afternoons a week to bounce Oliver while I caught up on emails. I lined up bigger projects again, and planned business trips. My husband and I hired some outside childcare. By the 8-month mark, we’d crafted a four-way babysitting plan that involved both my husband and me, my mom, and a genius babysitter, and together, the four of us sliced and diced the standard nine-to-five so that my husband and I could share in some of Oliver’s daytime care while each maintaining a 40-hour workweek. The murky waters of the nursing-whilst-typing period gave way to the clearer waters of scheduling and hand-offs. Oliver sometimes still visits my office and tests all the coffee cups, but mostly, my work life and my parenting life are separate. You could say I came back. The truth is, though? You never really come back. Maternity leave or not. Two weeks or twelve weeks. Paid or unpaid. 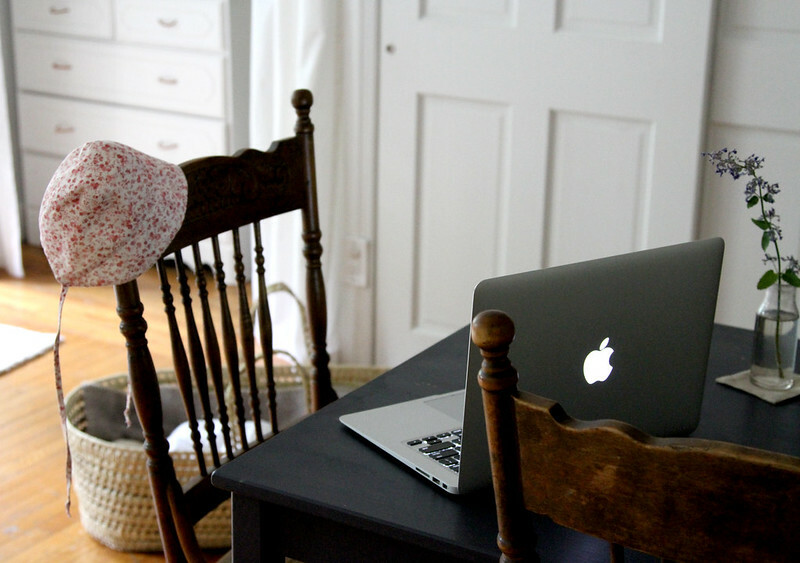 Telecommuting or part-timing or opting out of professional life entirely. The truth is that the early weeks and months after a baby arrives pull you into a world that you never quite step out of again, no matter the professional choices you make or the hours you work or the infinite number of ways you might rejigger your schedule to make room for everything: babies and jobs and family and friends and housework and fun. Becoming a parent is like stepping into Narnia: you’re changed once you’ve walked through that wardrobe, even if you can eventually find your way back out. How long will you take? they ask. I ask it, too. But now I know it’s a silly question. You’ll take forever, like all of us. 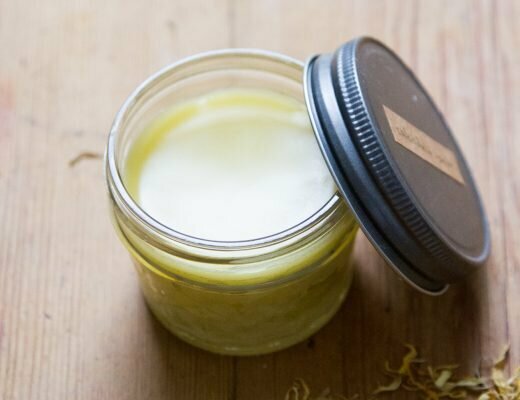 make your own: calendula salve. 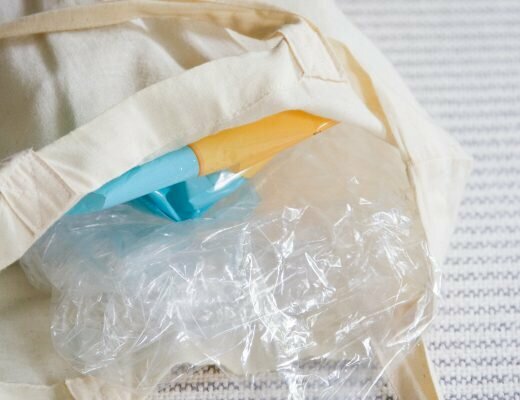 baby proof: kids’ clothes plain and simple. Thank you for this post, Caitlin! I'm sitting here at work in my third week back after maternity leave. I couldn't agree with you more–this is a whole new world. Yes, I'm back and working (and taking the occasional break, as you can see!) all while my heart is with that little baby. And at 5pm, I couldn't be happier to race home and love on her. I feel very fortunate that my job allows me to think critically and be creative. But the bottom line is I work to support my family. As you said, we're all looking for clues and searching for our own work/life balance. Best of luck to you and your family! Leaving my baby for the first time was so hard! We are fostering-to-adopt and so I had to use a week of vacation since maternity leave wasn't an option when we brought our little one home. I'm working, but am constantly thinking about what she is doing and how many hours I have left until I get to kiss her sweet head again. 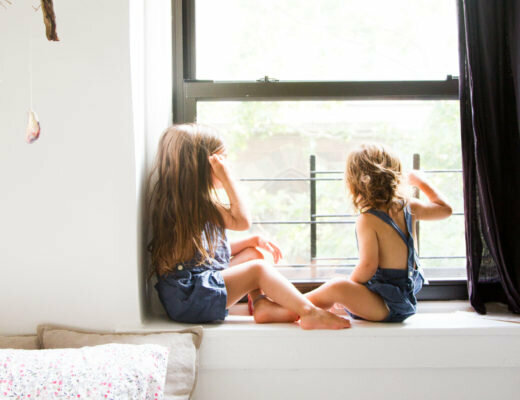 I'm not a mama yet but no matter – I am enjoying these sister posts so very much! Coming from the UK, I was SO shocked when I found out recently that in the US there's no legal requirement for employers to give paid maternity leave!! It must make it even harder to negotiate the decisions of work/family balance for new parents. Well said. My children are 33,28,16 and 14. Still, after all these years, there's always one foot planted at home while the other steps into the work place or wherever. If there's a real need for me, all else drops off and fades into the back ground as my mom role takes priority. Always and forever I'm a mom. well said. it's a message that's important to share. I took 10 weeks with my first daughter and will 10 weeks again (having our 2nd in August) and it's tough on so many levels. I'm so grateful to have stepped into Narnia and that although I'll leave the wardrobe in a few more weeks, I am changed. I'm a new mom to a beautiful 6-week old and this very truth has been among the most significant and unexpected lessons thus far. Thank you for articulating it. Here in Canada everyone assumes I'm on mat leave, since, if you've been working full-time for about 6 months, you automatically get about a year's worth of mat leave when your kid's born if you want it (or your husband/partner can take paternity leave for the same amount of time and you can stay at work instead, and it applies to people who adopt as well). I was just finishing grad school when my daughter was born, so I wasn't working enough to get official maternity leave. I knew the States was not great with mat leave, but I was a little gobsmacked when I was visiting my parents in the States at Christmas and a woman with a daughter the same age as mine (4 months then) asked if I was back at work yet, since she was. No one in Canada has ever asked me that. I couldn't imagine leaving her with someone else that young if we didn't absolutely have to. Right now I work part-time from home and plan to start looking for more work once she hits a year. This said, in Hungary, there are serious (let’s say 😉 ) difficulties regarding bureaucracy, corruption, unlawfulness, poverty, employment security esp for young women, a general shortage of part time jobs and flexy time and the entrepreneurs and the civil sector is so much burdened with irrealistically large taxes that depending on the business one runs, in many of them it would be really hard if not impossible to get by with a young baby at home. Plus, in Hungary (in Central-Eastern Europe: a former socialist block country) wages and the standard of life is much lower than in North America / Western Europe, resulting in for many young families to really struggle financially and not being able to afford private care, and while there are state owned free day-care possibilities too, but by far not enough, so it’s cheaper to stay at home for the 3 years for many young mothers. This shortage of affordable day care may be also due to the fact that mainstream Hungarian society strongly prefers a long stay at home for mothers with babies, motherhood is valued high on this level, and it’s considered to be The Norm to use the 3 years of maternity leave, but at least 2. So those few women get asked why-s who go back to work earlier (=most of them not earlier than after 1.5 years), and these why-s are often accompanied with quite direct hints of the neglectfulness of the mother who „leaves her baby with strangers”. Such a lovely post! I can't imagine how my life will change with a baby but thoroughly enjoy all this insight!